Compared to the last two monumental days on the road to recovery today seemed a bit of a trundle down a track. After getting up late this morning (slap wrists), trying to catch up on some sleep (bad night last night) I decided I would write out my Christmas cards. I am usually ahead of the game but this year feels a bit pants. I have so many jobs to do that I seem to be getting no where with and other bits coming in that I didn’t even touch a Christmas Card today. My morning was interrupted for some time with a last minute .com visit from the Community Physio and Occupational Therapist. I have to say it was a worthwhile visit even though not everything was good news. They assets me getting about around the house, saw how I was coping with some tasks, gave me some advice and offered me some services. The main problem is that the Physios and OT at Hinchingbrooke banned me from using the bath, shower and crutches so it was an opportunity to see if those bands could be lifted. Due to the shape of the bath, hollow walls and nothing to grab on to I am banned from the bath. 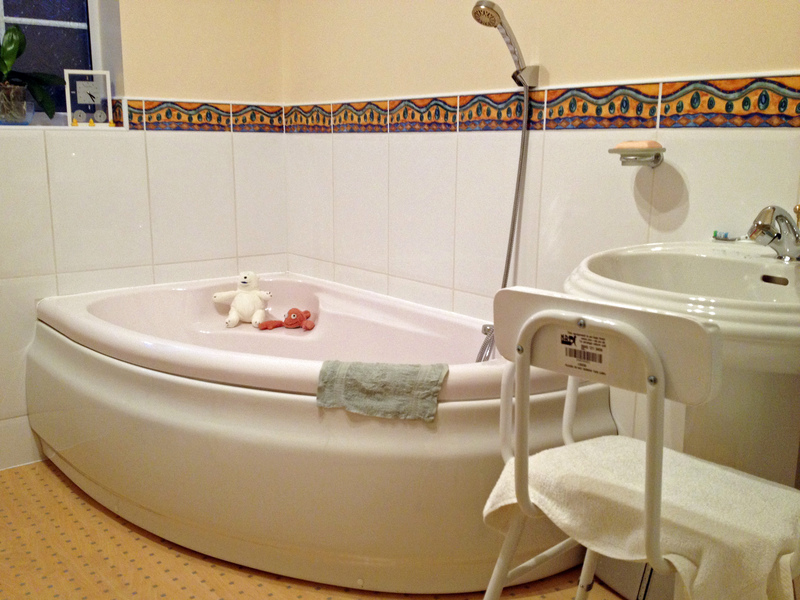 Similar story with the shower, even with the smaller walking frame it would be problematic for me to maneuver around with a shower stool in there too. There are hollow walls and nothing to grab on to, it may just be workable going in with a dry floor but when it is wet, no way! Conclusion, banned from the shower. So strip washes it is until we can go through the grant process to see if I can get funding to convert the bathroom to a shower room. The physio assessed me on crutches as I don’t like using the walking frame, I feel unsafe with it. I had been a whiz on them and if I had continued to use them after surgery I would have remained a whiz. As I have not been able to use them it felt really weird, I would have to practice with someone with me for a while to get my confidence back. I have been told to talk to my physio at Addenbrooke’s to see what she advises doing, not sure of that outcome on that one. The physio talked about another method of trying to ease the phantom pain by closing your eyes and imagining your leg is still there. Next you try and move the leg/foot to try and ease the feeling from the phantom sensations, I will give this a go and report back. He also said he would give me some exercises to do with a band to build up my shoulders and upper body, to help me while using the wheelchair. There was a mixture of, great that will really help me and oh god not another set of exercises! I mentioned that I noticed my wrists started to hurt when I have been out using the wheelchair for long periods, he said he could get me some wrist splints that might help. The physio can also refer me to the George Campbell Leisure Centre, March, where I can get discount on the Gym and Swimming. As soon as the wound is completely healed swimming is defiantly something I would love to get back to. On reflection not a bad day really, found out some useful information and options that I didn’t know were available to me.